A little more than a month after the official designation of Paris 2024 and LA 2028, the commitments take shape. Thus, while a multi-domain cooperation was announced this summer on the sidelines of the discussions with the International Olympic Committee (IOC), the Mayors of Paris and Los Angeles met on Monday to sign an Olympic twinning agreement. 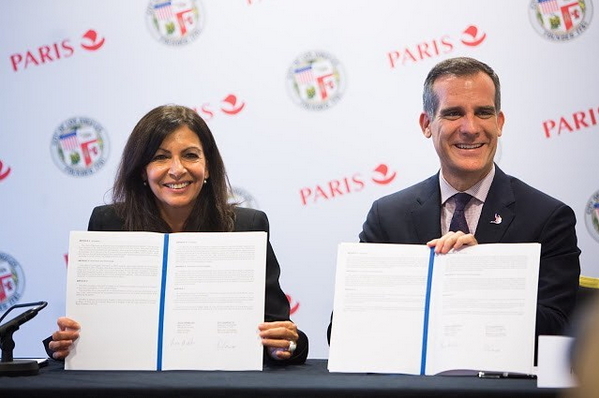 Anne Hidalgo and Eric Garcetti took advantage of a meeting of the C40 – the Together4Climate – in the French capital to concretize the commitment of a cooperation for the next eleven years. This cooperation will be in keeping with the spirit of the Games and will focus on three main areas : the fight against climate change and the protection of the environment ; solidarity and inclusion ; innovation and start-ups. Regarding the first area, and obviously linked to the actions led by Anne Hidalgo and Eric Garcetti in the C40, the two cities will seek an exemplary approach to energy efficiency, including the reduction of greenhouse gases, the establishment of zero emission transport, the development of renewable energies or the good management of water resources. Regarding the second area, Paris and Los Angeles intend to exchange « their best practices » for the integration and accommodation of homeless people and migrants. The issue of accessibility is not neglected, as both cities also want to respond to this important challenge which also concerns the 2024 and 2028 deadlines, with the organization of the Paralympic Games. Concerning the third area, the Mayors of Paris and Los Angeles want to establish exchanges with the actors of innovation (start-ups, incubators, companies, etc…) but also the actors of the economy of the territories (Chambers of Trade and Industry, Tourism and Congress Committees, etc…) to create sustainable synergies for both cities. To complete and clarify the outlines of this unprecedented cooperation agreement between two Olympic Cities, a Twinning Committee will soon be established. It will, logically, be co-chaired by Anne Hidalgo and Eric Garcetti.